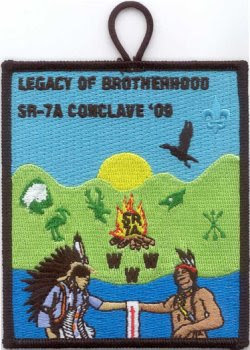 Wahunsenakah Lodge 333 hosted the 2009 Section SR-7A Conclave at Bayport Scout Reservation in Jamaica, Virginia on April 24-26, welcoming over 900 Arrowmen to the first OA conclave at the new camp. The theme for the event was Legacy of Brotherhood. A number of patches were issued, and I hope to have pictures of them all here in the near future. You can find the items issued by the Section on the SR-7A web page and the items issued by the host Lodge on the Wahunsenakah Lodge page. Thanks to Tim Ewing and Larry Johnson for the excellent patch pictures from the conclave.